One more photo of the Foresthill Bridge before we move on. I read that this is the tallest bridge in California, but I think it depends on what you're measuring. The Golden Gate Bridge has taller towers but the Foresthill Bridge has a higher deck. The bridge is scheduled to be repainted, get a center deck placed between the two existing decks, and be seismically retrofitted next year at a cost of $70 million. The bridge was built 36 years ago at a cost $13 million. It was originally painted with lead-based paint and so it will cost $27 million to carefully remove the existing paint, prime the bridge, and repaint it a similar shade of green. 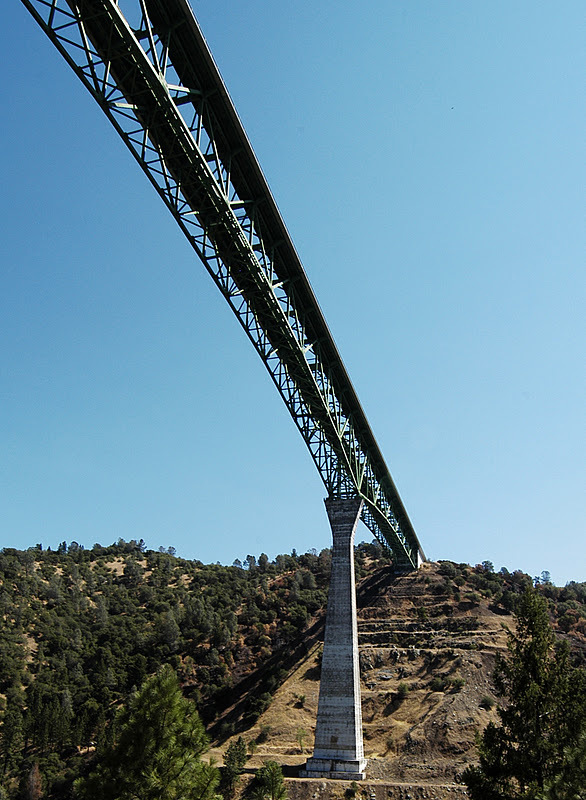 I guess they weren't thinking about earthquakes when they built the bridge, although it was an earthquake up north in Oroville that eventually stopped them from building a dam under the bridge. I know there are some M6.5 faults in the foothills, but I can't remember how far away they are from the bridge. Such a tall, flexible structure wouldn't be damaged by shear forces, but the large displacements might be a problem. I recall that they are going to install buckling-restrained braces to act as dampers and reduce the displacement of the superstructure during earthquakes. American River Bridges: Foresthill Bridge (4) by Mark Yashinsky is licensed under a Creative Commons Attribution-Noncommercial-No Derivative Works 3.0 United States License.